Neat info....but the belt/track is on backwards. You always want the 'cleats' pointing towards the rear so they will be self cleaning from any mud or dirt. Same goes for tractor tires. Damn there is some awesome pics there. Thanks Terry. 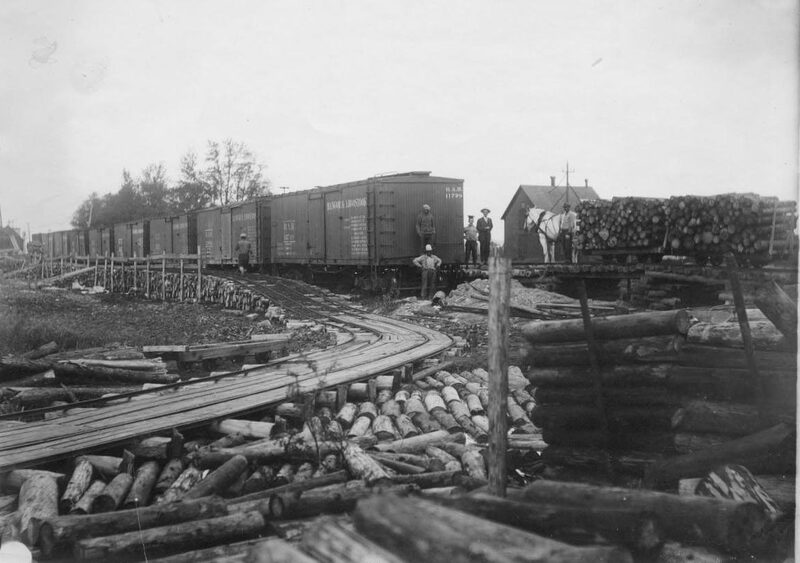 Here we have Bangor & Aroostook Railroad box cars being loaded with bolts of pulp wood using horse drawn cars. note how the ties are pulpwood, the pier in the foreground is made of pulp wood and the ramp is made from a stack of pulp wood. Don't have any details, but this would be an interesting project. "It was an American tradition, like fathers chasing kids around with power tools." american or english i looks like it would be underpowered very hairy to do a hill start. An experimental monorail was built in Burbank, CA by J.W. Fawkes in 1907. He built the prototype on his Burbank ranch, running in a line between Lake and Flower Street. The name of his company was Aerial Trolley Car Co. Inc. Mr. Fawkes called it the 'Aerial Swallow'. The public called it 'Fawkes' Folly'. I know Chuck likes his Coke signs. Mogadishu, too funny! Interesting to see how the rust is forming along the edges of the white paint on the words Enjoy Coca-Cola. Well what ever you want to call it - Christmas or just another day near the end of yet another year - have a good one !! Yeah , what he says ! For anyone that's interested , the brickwork is English Gardenwall Bond ! If Nicks is English - mine is COBBLES - beach washed that is ! Kit now available from "Snot Goblins Promotions"
That is a very thought provoking sign. Coke is everywhere man! Even in places where people are starving or a trip to the local bodega could get you killed. Still, a dio with a warlords "technical" next to that sign would be interesting.